Apparently there is no quality control with this company. I ordered 3 36"x36" frames & 3 out of the 3 were damaged. I emailed pictures to the company. I had no response until a week later I received a shipping confirmation that they re-send 2 new frames. I thought this was great but I just got the replacement frames & 1 was as damaged as the first order (I put a photo of the damage below). There obviously no quality control here. Hi Denise. Thank you for your review. We regret to hear that you have had this experience and want to make things right for you. We have passed your feedback along to our shipping department so that this does not reoccur for you. Our customer care team is available Monday-Friday 8am-7pm eastern time and can be reached at 1-800-332-8884 for additional assistance. We appreciate your business and hope to serve you better in the future! This frame is beautiful. I replaced my original frame with my new frame and I only get complements on the painting. Customer service is excellent. I recommended my friends to pictureframes.com. These are simple, but elegant frames. Perfect for old masters time period pictures. I use them for giclee reproductions, and they look like expensive pieces. Service from company was good as always. Trying to match 3 oil paintings with the color of wall where they will be placed. Your on-line selection process made the experience interesting and absorbing. Too absorbing-spent hours holding pictures to screen and printing samples. Final decision was not that tough because of your wide selection of frames. Examples shown on some frames was helpful. I have ordered before and have been very satisfied. Price is right and I figure if I make a mistake it would not be a costly one. Good price and the quality that I have received in the past. It will compliment the finished painting - simple, not fancy! (1) rabbet depth was deep enough for a stretched canvas. (2) color. (3) width. My canvas is 1 1/2 “ deep (rabbet?). I want to make sure the frame is flat against the wall so that canvas is all the way seated in the frame. Do I need a rabbet that is 1 1/2”? The frame I like is W55 - Renoir Collection. My canvas is 38x38. 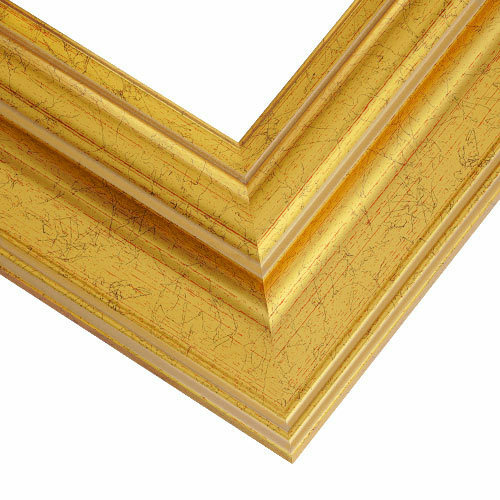 I used this frame on a canvas of about 11/16" depth (.67") and it just fit inside the frame with 1/16th inch to spare. That means your 1 1/2" canvas would not be flush to the frame, but wouldt extend outside it by 3/4". I have had this happen with other canvas/frame combinations before and accommodated for it by covering the back of the frame with craft paper and using thicker pads on the bottom of the frame to make it hang more evenly on the wall. If you want to avoid this completely you do need a frame with a 1 1/2 inch or deeper rabbet. This is a nice frame for the price. The gold tone is pretty and not garish. Yes, you do need a rabbet that is 1 1/2". It is a very nice frame. I used it on a painting 39" x 53" with 1 1/2" deep stretcher bars. The canvas will extend beyond the frame by 3/4". Doesn't bother me having the painting extended beyond the frame. But that is a personal choice, for you to decide. I use a frame I like regardless of rabbet depth. my choice. Yes, if you wish the canvas to sit flush with the wall then you will want to make sure that the rabbet is 1 1/2" deep or deeper to fit your specific canvas. Thanks Elise. I ordered a floater frame which has the depth I need! Would hate to make a mistake on your dime - I don't know.